The is a really novel project with the aim of discovering how the polarization of light plays a role in parasitoid wasps attacking crop pests, and how we can use that information to enhance their value as biocontrol agents. The PhD will be supervised jointly by Nick and Martin at Bristol and Prof Martin Stevens at the University of Exeter. Dr Cassie Stoddard at Princeton is also a collaborator on the project. Click here for a direct link to more information about this PhD. The PhD will explore how anthropogenic light pollution is affecting the phenotypic variation found in animal visual systems. This is a really exciting new direction and is a new way to address a major global challenge. The work will be supervised by Nick and Martin at Bristol, Suzanne Williams at the NHM and Nathan Hart at Macquarie University in Australia. 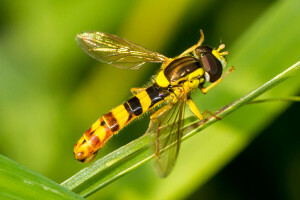 This is another fantastic project that will be looking at hoverfly migration and their use of the polarization of light as a navigational cue. The big question is how does the time compensation in their compass work. See Karl's website for more information and this project will be supervised by Karl and Nick. Animals often communicate with one another using multiple sensory modalities (e.g. simultaneous visual, acoustic and olfactory signals). Such multimodal communication can modulate neural and perceptual processing, increase the likelihood of receiver responses, and facilitate the transfer of complementary information. The overall aim of this PhD project is to use alarm signalling in coral reef fish (i) to investigate the relative use of different sensory channels and (ii) to explore how multimodal communication is affected by various global pollutants. The SWBio and NERC GW4+ websites provide detailed information about the application process. If you are interested - please contact Nick first to find out more about the projects.